As a cement auger manufacturer, we produce heavy-duty Fast-Way Cement Auger. It comes with a bag breaker (when bulk cement is not available) and a small pour is required, can be used with 94# cement bags. It can be used with the Fast-Way batch plant, and can be equipped with electric motor, gas engine, or diesel motor. For contractors on the move, control your contracts without a large investment. 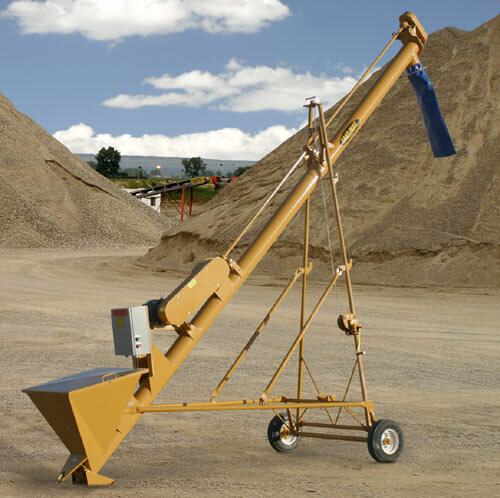 Our portable cement auger lets you produce concrete at any location when bulk cement is not available. Here’s all you need: a Fast-Way Batch Plant, a Fast-Way Cement Auger, a mixer truck and a loader. The cement auger tube is quickly raised from the tow position by the hand winch. After inserting the mast safety pin, the cement auger is ready for production. Contact us, an experienced cement auger manufacturer, with any questions you have regarding our machine—experience a quality portable cement auger today.